Accused of plotting the assassination of the Russian President, CIA officer Evelyn Salt (Angelina Jolie) raises suspicion by going on the run. As the hunt intensifies, will Salt be able to prove her innocence in this fast-paced action thriller from ‘Patriot Games’ director Phillip Noyce? Evelyn Salt (Angelina Jolie) is a CIA officer that is identified by a defector as a Russian sleeper spy and is accused of plotting the assassination of the visiting Russian President. Her CIA superiors are quickly convinced that she is involved in an international conspiracy and make her the target of an intense hunt. Evelyn risks her own life and that of her husband to prove that someone else is the traitor. – Click here to read original review. 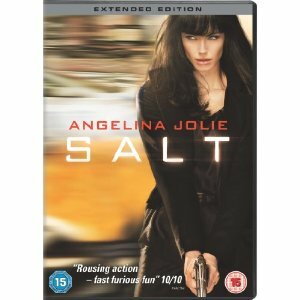 Well I watched “Salt” last night and I thought it was a good action film. “Salt” is a cross between James bond and Jason Bourne with a sprinkle of Mission Impossible. It was directed by the same director as clear and present danger (Phillip Noyce), so you know he does action and does it very well. It stars the very attractive Angelina Jolie, with Liev Schreiber and Chiwetel Ejiofor playing CIA agents and NSA agents. Lots of Guns and chases all the way through. It got a few twists and I feel that we will see more of Salt in the coming years. Good flick well worth the watch. By the way if you do not like spiders you might want to keep an eye out for a few big ones at the start of the movie.